Bug Busters Pest Control Services’ Spider Control Treatment takes away any worry of spiders running around your house for you so that you and your family can enjoy time playing hide and seek, and dad can confidently go fetch another stack of firewood for s’mores without having to worry about spiders getting in the way. Enjoy the evening outside with your friends without ducking and trying to avoid those spider webs overhead. Our trained certified technicians understand your concerns and are here to help releive those. As some spiders can be deadly, we will eliminate spiders and replace them with peace of mind. We uphold accredited standards to minimize any disruption to your home environment and daily routines. Plus Bug Busters uses only environmentally responsible treatment methods. 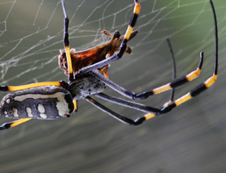 Depending on your location, we have one-time treatments to rid spiders, or year-round spider control plans. 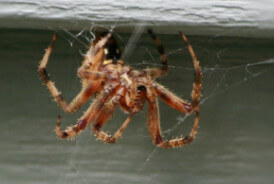 Keep the spiders away, give us a call today to schedule your free, no obligation inspection. The spiny-legged and mostly common American House Spider are scary to some, but non-lethal if bitten. The webs created by American House Spiders are classic and messy webs like your parents used to make with cotton on the porch for Halloween. It is commonly known as the cobweb. The American House Spider has long, skinny legs and hairs on the back of their ankles. They are skilled hunters with the ability to kill their insect victims with merely one bite. Though they rarely pay any mind to humans, they are sometimes mistaken for their close cousin, the Black Widow. 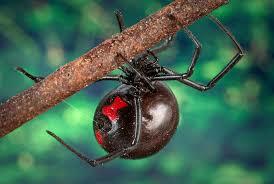 The Black Widow is indeed found in your area of Virginia, but like to stay hidden in dark places. They are often found in wood piles, stacks of cinder blocks, or even crawl spaces. These spiders unlike the common American House Spider prefer to be behind the scenes, and also spin their webs out of site. The Black Widow is a concern if a human is bitten. We suggest you immediately seek medical attention if you believe you or a loved one have been bitten by a Black Widow. If you can, try to take the body of the spider with you where a medical professional can determine the type of spider so they know how to treat you. Another bit of advice is to teach your children about the distinguishing mark of the Black Widow, as the RED markings on its body with help to quickly identify them. As always though, make sure that your children know that if they want to play in areas of your yard that are good hiding spots, they may be introduced to the Black Widow without even wanting to meet one.